The body of a scorpion consists of a cephalon thorax containing the mouthparts, eyes and eight legs. The abdomen is made up of seven segments followed by a six-segmented tail. The characteristic pincers of a scorpion are modified mouthparts and the stinger at the end of the tail contains two venom glands with ducts terminating at the end of the stinger. 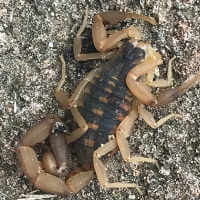 On the underside of the scorpion a pair of comb-like organs are located between the last pair of legs. These are used to relay vibrations from possible prey or predators and tactile information as the scorpion moves. Scorpions are primarily nocturnal and like to rest in cool dark areas during the day to conserve moisture. 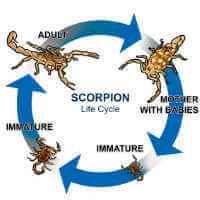 Life Cycle - Scorpions can live for many years. The eggs hatch inside the mother and after they are born they crawl onto the mother's back where they are protected. After they molt they disperse from their mother. Most scorpions undergo five or six molts before becoming adults.